The Finches Are Coming, The Finches Are Coming! And birds in the Finch family! Many seed, nut and fruit crops are poor to low in Canada this year, which means we can expect an irruption, or flight year this fall and winter! That also means we may be seeing some very special and hungry visitors at our feeders. 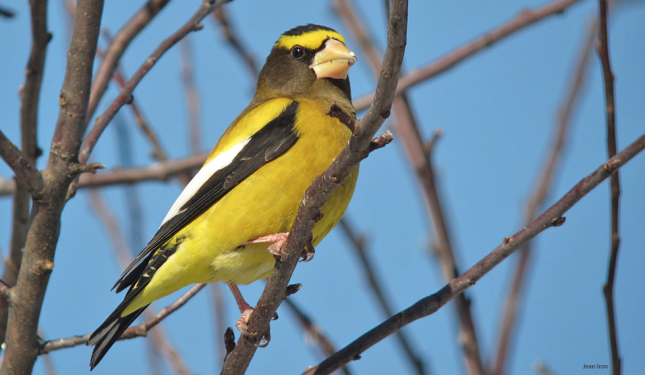 Some of the birds that may be visiting our feeders include Pine and Evening Grosbeaks. Their favorite feeder foods include black-oil and striped sunflower seeds, sunflower chips, safflower, peanut splits and Bark Butter. Purple Finches are also expected to move south, possibly into New England. They’re attracted to black-oil sunflower seeds, sunflower chips, safflower, as well as nyjer/thistle seed. Pine Siskins may also show up in our yards this season. Siskins are partial to black-oil sunflower seeds and sunflower chips and they love nyjer/thistle. Some non-Finch species are also moving south due to this lack of food. A very large flight of Blue Jays is irrupting south and appreciate peanuts and tree nuts, black-oil sunflower seed, striped sunflower seed, sunflower chips, suet and Bark Butter. The adorable Red-breasted Nuthatch is also irrupting south and will eat everything their White-breasted cousins like…peanuts and tree nuts, black-oil sunflower and striped sunflower seeds and sunflower chips, safflower, mealworms, suet and Bark Butter.